Wheat in everyday English designates a particular grassy plant that produces a starchy grain or seed. Most people think of wheat primarily in terms of this grain, which is used to make bread, cookies (biscuits), pastries, and pasta. Consumers easily distinguish between wheat and other grains such as rice, oats, maize, rye, and barley as they appear in manufactured products or as ready-to-consume grain in food stores. In contrast to their savvy as consumers, most urban dwellers probably could not differentiate between these grains in the farmer's field, particularly between wheat, rye, and barley. Nor could they necessarily give a good explanation of why wheat is particularly suitable for the products in which it is used. Moreover, they probably would be unfamiliar with other uses of wheat, such as using the grain for feed or the straw for fodder and roof thatching. Finally, in all likelihood these consumers would be hard-pressed to give details about the quantities of grain that can be obtained per hectare per year or much about how yields have increased in recent decades. In short, most consumers know and appreciate wheat but only on rather narrow and unsophisticated grounds. To understand the remarkable increases in yield that were obtained in wheat after 1940 requires delving briefly into the botanical properties of the plant and knowing how wheat came to be the single most important grain crop in the world. From a botanical point of view, three questions are most prominent. First, what is the normal life cycle of wheat? Second, what are the basic anatomical parts of the wheat plant? These first two questions are fundamental to the working tools of wheat breeders because a major part of plant breeding involved learning to manipulate the life cycle and anatomy of the plant in order to achieve objectives desired. Third, how can one most usefully distinguish the different types or varieties of plants, all of which we call by the generic term, wheat? 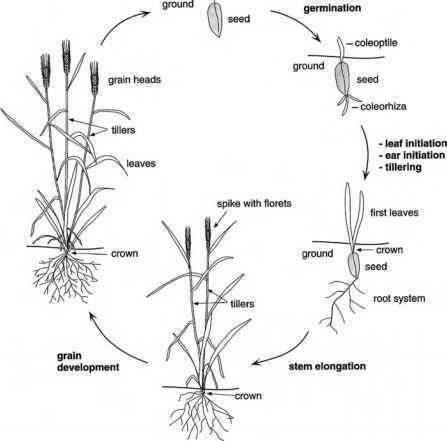 Wheat's life cycle and anatomy can be briefly summarized (Figures 2.1 and 2.2).1 A wheat seed (grain) consists of a plant embryo and starchy endosperm surrounded by a protective seed coat. Under proper conditions, the seed imbibes water and initiates the sprouting process by sending out a coleorhiza, which gives rise to roots, and a coleoptile, a protective sheath that pushes above the ground and allows the first leaves contained within it to emerge into the daylight and begin photosynthesis. Until the first leaves start to photosynthesize, the young seedling is dependent upon the sugars stored in the starchy endosperm for its energy. 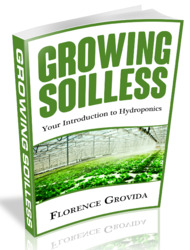 Growth above the ground during the first part of the plant's life consists primarily of the production of new leaves. Each leaf develops from a small ridge on the growing tip of the main stem of the young wheat plant, which for many weeks remains hidden beneath the ground. In the early stages of the plant's growth, the distance along the stem between leaves is small, and from above the ground it appears that the leaves simply emerge from a small lump of tissue (the crown) that lies just beneath the soil surface. Events of tremendous importance to yields, however, are occurring within the crown of the young plant. The growing tip of the main stem, after four to eight leaves have emerged above ground and after producing all of the ridges that give rise to leaves, changes from vegetative growth (production of leaves) to ear and spikelet formation, the structures within which the seed (grain) of the next generation will form. Each growing tip produces about twenty spikelets on the wheat ear. Figure 2.1 Life cycle of wheat. Line drawing by Tim F. Knight. Adapted from E. J. M Kirby and Margaret Appleyard, Cereal Development Guide, 2d ed. (Warwickshire, England: National Agricultural Centre, 1987), p. 4.
spikelets. Not all axils produce tillers, but the ability of wheat to form these structures is critical to obtaining high yields from the plant. Typically, a modern high-yielding variety of wheat will produce one main stem and about three tillers. 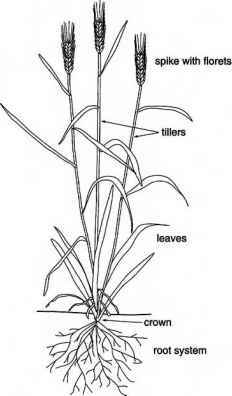 As the season progresses, the growing tips of both the main stem and the tillers move from ear and spikelet formation into floret formation. The ear of a wheat plant is called the spike, and spikelets are small structures along the ear that contain the flowers or florets of the plant. Each floret has the potential to form a new seed (grain), and each spikelet may form as many as ten florets. Seldom, however, do more than three to six florets actually mature and produce a seed. Figure 2.2 Anatomy of the wheat plant. Line drawing by Tim F. Knight. Adapted from E. J. M Kirby and Margaret Appleyard, Cereal Development Guide, 2d ed. (Warwickshire, England: National Agricultural Centre, 1987), pp. 4, 12, 13, 14.
above ground, to a height of 0.5 to 2.0 meters, depending upon the variety. There the florets mature, meaning the anthers release their pollen, which lands on the receptive stigmas of the female parts of the floret. Fertilization thus occurs, and the floret proceeds to ripen a new seed. If the seed is used for replanting, the life cycle starts again. If it is diverted for food or feed purposes, we call it grain. Yields from seed to harvest are critically dependent upon the development sequence just described. Some simple arithmetic makes clear the magnitude of increase that can be obtained: one seed can typically give rise to a main stem and three tillers to create four ears of wheat. Each ear can have twenty spikelets, each with three florets that form a new seed. Thus one seed can give rise in the next generation to something like 240 seeds (4 ears x 20 spikelets/ear x 3 florets/spikelet = 240 new seeds). If the plant produces even one or two more tillers, the seed yield per plant can go over 300 seeds. To be sure, other factors, particularly soil fertility, plant spacing, temperature, water, and pest problems, can diminish these yields. But a potential for such a high return on the seeds planted is present. Total yield of grain in kilograms per hectare will also depend upon the size and weight of each grain. In contrast to the relative simplicity of the life cycle and anatomy of the wheat plant, its classification shows a bewildering confusion and uncertainty. Some semblance of order and tidiness, however, emerges from realizing that wheat is now classified within two different but hierarchically related schemes. First, the plant is classified by botanists in ways that show how they think it is linked anatomically, genetically, and evolutionarily to other species of plants. Second, wheat is classified by agronomists in ways that distinguish critically important differences between varieties in terms of how the crop can be grown and used. Wheat has been placed in formal classification schemes since at least classical antiquity, when Columella identified two classifications similar to what were later called the "naked" and "hulled" categories.2 Naked wheats were those in which the seed detached easily from the ear and spikelet; hulled wheats were those in which the rachis, or backbone of the ear, broke ("shattered") and the seeds were tightly held inside chaff (the glumes of the spikelets, which enclosed the florets). Linnaeus in the eighteenth century, in contrast to Columella, placed all wheats into one genus, Triticum, and identified a total of five species. Succeeding botanists of the eighteenth and nineteenth centuries continued to grapple with what were a seemingly unending series of variations by which wheat was known.3 The number of species increased as scientific botanists became more familiar with a plant that grew in virtually all parts of the world except the very humid rainy tropics. Moreover, no scheme agreed much with the others in terms of precise names, the criteria by which names should be given, or how to relate the cultivated wheats with a number of grassy weeds that seemed to share many of wheat's characteristics. Most authorities now agree that wheat comes in three major groups.4 The "diploid" group have fourteen chromosomes in each somatic cell, the "tetraploid" group have twenty-eight, and the "hexaploid" have forty-two.5 Virtually all wheat cultivated in the world today is a hexaploid wheat generally designated as Triticum aestivum. Substantial quantities of the tetraploid wheat, Triticum durum, are also grown. Only very minor quantities of other varieties are still in cultivation. Wheat is also considered by most contemporary botanists to be related in an evolutionary fashion to a great many other grasses, many of which are of high economic value to people. T. E. Miller, of the Plant Breeding Institute of England, places wheat in the tribe Triticeae of the family Poaceae (Gramineae). The tribe contains twenty-five generally recognized genera, each of which is composed of a series of species. Some genera have only annuals, some only perennials, and some both. 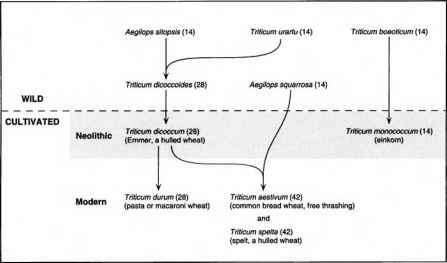 Within the tribe Triticeae are three genera of high importance as human food and animal feed: Triticum, which contains wheats; Secale, which contains ryes; and Hordeum, which contains barleys.6 To the casual eye, in fact, wheat, rye, and barley can be easily confused. To those who grow and use these cereals directly, however, the differences between these three grains are large. Agronomists and cereal technologists take up the classification problems of wheat where the botanists leave off.7 Three sets of characteristics are generally of most importance in the classification of wheat by practical considerations of growing and using the grain: growth habit, hardness, and color. Growth habit refers to the time of normal planting of wheat when it is grown in the northern temperate regions of the world. "Winter" wheats are those that are planted in the fall, grow for a short period before cold weather, remain dormant over the winter, resume growth in the spring, and ripen for harvest starting about midsummer. "Spring" wheats, in contrast, are planted in the spring, grow over the summer, and ripen in late summer to early fall. Spring wheats are generally grown in areas with severe winters that kill the overwintering plants of winter wheat varieties. Winter wheats are otherwise often preferred because they yield more than do typical spring wheats. The extra yield results primarily from the longer time they have in the ground and from the fact that winter wheats resuming growth in the spring are already established plants just waiting to take off. Hard wheats, because of the extra protein, are good for making breads with a highly spongy texture. In fact, some baking technologists go so far as to refer to bread as "foamed gluten." Gluten is the elastic protein in wheat that is puffed up by the carbon dioxide released by yeast.9 They are used for the leavened breads typical of the United States, Canada, and Britain. Soft wheats are good for making unspongy bread, typical of "French" bread, crackers, pastries, cakes, cookies or biscuits, and noodles typical of eastern and Southeast Asia. Triticum durum are known as macaroni or pasta wheats, reflecting the predominant uses of that variety. Color is the third major trait for classification of wheats. Most wheats are either "red" or "white," the difference being whether or not the seed coat contains a colored, resinous material.12 Determination of color is genetic.13 In some areas such as the United States, different wheat-growing regions are often known by whether red or white wheats predominate. The distinction between red and white wheats is highly visible in the harvested grain, but it tends to be of practical importance only in special circumstances. In South Asia, for example, people may have a strong preference for white wheats for making chapatis because they prefer the lighter white color of flour made from white wheats, but they will use red grains if no white wheats are available. In the United States and eastern Asia, red soft wheats are preferred to white soft wheats for producing soup thickeners. This preference derives from the higher resistance red soft wheats have to sprouting of the grain in the ear before harvest. When a grain sprouts, the starch is degraded and is less suitable for uses such as soup thickener.14 A soup manufacturer is thus safer in buying soft red wheat than soft white wheat, which may have been damaged by sprouting in wet harvest years. What is the meaning of the axil of a plant? What is the wheat plant ear? What is part of a wheat plant? How the wheat plant has adapted? Where do seeds develop in a plant? What is the cycle of wheat? Which wheat plant used in green revolution? What is the lifespan of wheat plant? What is the part of the wheat plant where growth begins? How a wheat plant develop? WHERE GRAIN IS ON WHEAT PLANT? What are the parts of a wwheat plant? What are the parts of wheat plant? What is classification of plant drawing?